BBC NEWS | Health | Can our natural rhythm heal us? Could a natural rhythm - which some experts believe we all possess - be a cure for a variety of health problems? Musician Simon Lee, from Kent, is called on to teach drumming to patients with problems ranging from addiction to autism, and learning difficulties to mental health issues. He has even offered help to terminally ill patients needing palliative care. And he says the results are amazing. 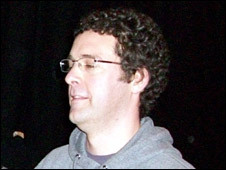 "Drumming has a number of benefits," said Simon. "It can energise or relax. It can foster a sense of playfulness or release anger and tension. It can also help in the conquering of social isolation and the building of positive relationships." One patient, an alcoholic, told Simon her drumming sessions had helped her so much it had given her the inspiration to continue with a gruelling detox course. "She said when she came into the clinic she was extremely negative and the first two or three days the treatment was purely about detox and heavy stuff," said Simon. "The drumming was the first time she engaged and smiled. "She said 'I came out of myself and saw that I could survive'." Simon, who also carries out drumming sessions for the general public, said there was a growing interest in the therapeutic effect it could have, both on the individual and the community. "There is strong evidence to suggest that drumming may actually be a healing activity," he said. "Some have gone so far as to prove that time spent drumming can positively affect our immune systems, levels of stress and psychological well being." 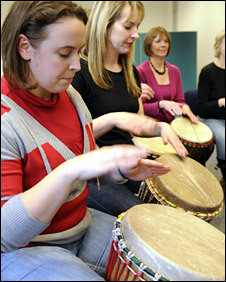 Stephen Clift, professor of health education at Canterbury University and director of research at the Sidney De Haan Research Centre for Arts and Health, Folkestone, said his centre had recently hosted a workshop into the benefits of drumming. "It gives a general sense of well being," he said. "As a research centre we are interested in arts and health generally but particularly in regards to music. "Most of the work we have been doing is in regards to singing, particularly in groups and community sessions - but these benefits apply to drumming. "It is fun and challenging, but can produce very positive results very quickly." And although some might disagree, he believes that everybody has a sense of rhythm. "I believe we are hard wired for music there is evidence that even in the womb the foetus has rhythm," he said. "We are all naturally musical, although in the US less than 7% of adults over the age of 18 even pick up a musical instrument once a year. "Drums are accessible and don't present the challenge of a learning curve - anyone regardless of handicap can sit and beat out a rhythm on a drum. "Drumming is affordable, accessible and sustainable. "I think we all begin as drummers if you think about childhood the children are under the table banging on pots and pans." 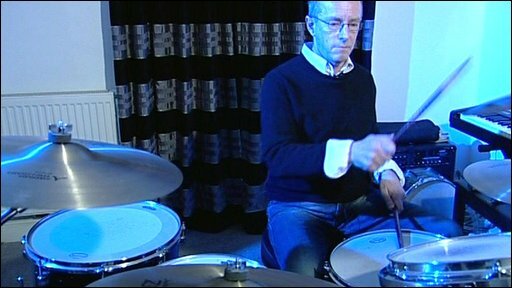 Nick "Topper" Headon, former drummer of the legendary 1970s punk group The Clash, is one who subscribes to the theory that drumming is good for the psyche. Unfortunately a drug problem developed while he was playing with The Clash meant that he went 26 years without playing the drums, but now that he has finally kicked his drug habit he once again enjoys the buzz of hammering away on his kit. He said: "Its a physical activity, it stimulates parts of the brain keeping the four limbs doing something different, and it is primeval as well - drums were the first instrument: before music, people were banging things together."